[Currently Viewing:] 30 FIVE-FINGER PATTERNS music images – Make your own Music Worksheets – includes the original tutorial. Ever find yourself wanting to make a music worksheet for your students, but don’t have easy access to any music notation software? This tutorial will get you on your way to creating your own music worksheets using a word processor on your computer — without purchasing an expensive music notation software. Once you’ve created some worksheets, you can print as many worksheets as you need and send them home with your students. Using Finale software, I have saved tons of image files of chords, five finger patterns, arpeggios, etc. on my computer over the last couple years. I’d like to share them with you, so you can make your own music worksheets using just a simple word processor like Microsoft Word. Need ideas for what to give all your music students this year for Christmas or to reward them after a performance? Trying to stay within a budget? How about making grab bags full of music goodies! Your students are bound to be thrilled with this music-themed gift. Yesterday, I came across this great resource for reading other teachers’ Studio Policies! It’s called the Pno-Ped-L Studio Policy Website. The website is not fancy, but there’s a lot of good information there. This site has a collection of Studio Policies submitted by teachers all across America and Canada. (Names, tuition rates, and locations have been omitted for privacy.) What a great way to see how other teachers handle absences, payment, cancellations, etc! To see my other posts concerning Studio Policies, see here and here. In other areas of the site, they have examples of parents letters, game and camp ideas, and other teaching ideas. Check it out! 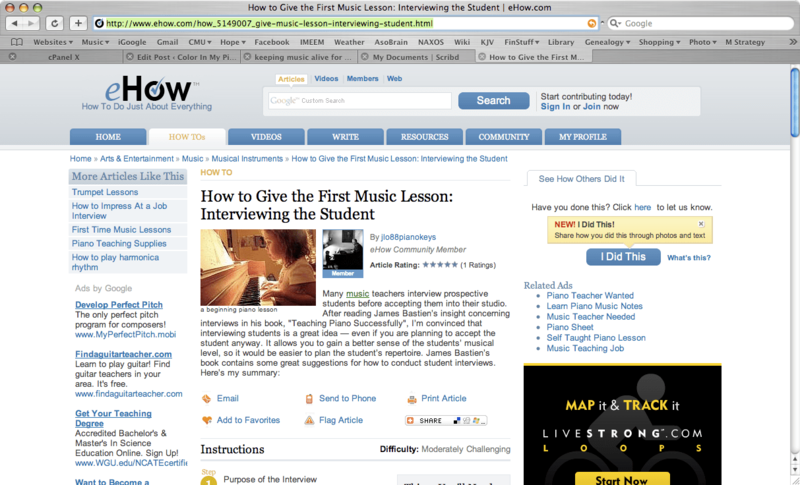 One of my favorite blogs I follow is Susan Paradis’ Piano Teacher Resources. She does an amazing job creating colorful worksheets, games, etc. on her computer and she puts them up on her website to share with other teachers. A couple months ago, I had the opportunity to try out her Music Bingo game (complete with boards and calling cards) with a group of my students. This version is suitable for elementary level students. For even younger students, Susan Paradis has created a simpler version, available here. Did you know that iTunes offers free downloads each week? If you use iTunes on your computer (you can download it here) and if you have an account on iTunes that allows you to download, you can access free mp3’s to add to your music library. They usually showcase a different genre of music each week (sorry, Classical music doesn’t come up very often) and often showcase a new up-and-coming artist. Click here to visit my eHow article on this topic. As a fellow piano teacher, I can’t stress enough how important it is to have written Studio Policies. They’re great for letting new students know about how your studio is run! It will help improve the level of communication between you and the parent/student, because it becomes more clear what you each expect of each other. Studio name. This may seem insignificant, but it’s surprising how much more professional you will look just by naming your studio. It doesn’t have to be fancy; just try something like Piano Studio of Joy Morin or The Morin Music Studio. Welcome to the new colorinmypiano.com! Welcome to colorinmypiano at the new url location! What do you think of the new look? I registered my domain name with Name.com and have bought a year of web hosting from HawkHost.com. So far, I’m very pleased with the services I’m paying for. And I absolutely love using WordPress for my blog. If you haven’t tried using eHow before, give it a shot! There’s lots of great articles to browse through, and it is fairly easy to write your own articles. Many teachers interview prospective students before accepting them into their studio. While I haven’t yet felt the need to do so with my own studio, after reading James Bastien’s insight concerning interviews in his book Teaching Piano Successfully, I’m convinced that interviewing students is a great idea — even if you are planning to accept the student anyway.